Clan Tutorial for Both New and Seasoned Players Offers Fresh Ways for Players to Succeed. 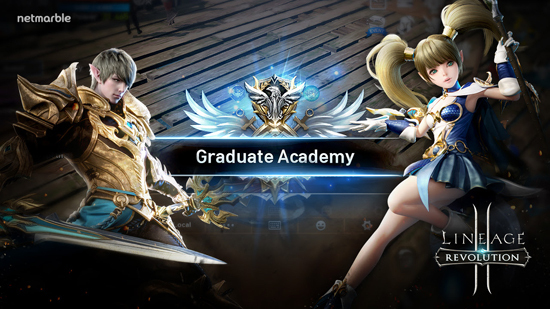 Update for mobile MMORPG, Lineage 2: Revolution (http://l2.netmarble.com/), introducing the Academy Clan – a tutorial for new and veteran players that guides players through the Clan system and helps them achieve victory. Players level 10 through 180, who have yet to join a Clan, can join the Academy Clan to play through the full Academy Clan tutorial. Those who are part of the Academy Clan are able to stay a member until they reach level 181, at which point they will graduate and be recommended to join a player-led Clan. Players are also freely able to leave and register for the Academy Clan at any time. To celebrate the new tutorial, three new Clan-specific events will be held from August 8 to August 29. The “For the Clan! Event” will offer special rewards including R-grade Armour Boxes, R-grade Mount Equipment Boxes and Radiant Upgrade Stone Selection Boxes to all players in Clans, including new Academy Clan players, after they have completed a series of Clan-specific missions. When members of a Clan donate items to their fellow members, they will also receive 1.5x more Adena than usual via the “Clan Check-In and Donation Reward Event.” A new “Clan Penalty Period Decrease Event” will also lessen the penalties of leaving and rejoining Clans during the event period, so players will have a chance to try out a variety of Clans. A new Equipment Collection feature has also been introduced, where, by collecting specific Attribute Equipment through their time in the game, players will receive additional rewards and stats that will strengthen their character. The Tower of Insolence will also now go up to 120 floors through the latest in-game update. All players will receive 500 Red Diamonds when they reach the 120th floor by August 29. Players can also compete to reach the 120th floor first during the “Tower of Insolence World’s First Clear! Event” from August 8 to August 29. The first 10 players from each server to clear the 120th floor of the Tower will be rewarded with Blue Diamonds. The first-place finisher will receive 5,000 Blue Diamonds, the second to fifth place finishers will receive 2,000 Blue Diamonds, and sixth to tenth place finishers will receive 1,000.